Wifestyles Blog & Photography: Help! I got my Rebel and I couldn't be more excited! I've been photography obsessed for sometime now and I'm anxious to see where this little baby takes me! In the mean time while I'm exploring the broad spectrum of functions and fundamentals, I've decided it's time to accessorize my little gem! 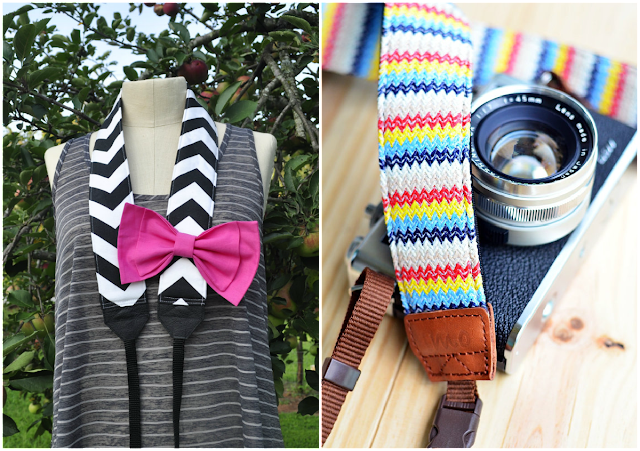 I've finally narrowed it down to these two camera straps from Etsy! I'm still having such a hard time deciding! So if you guys could please VOTE to help me out that would be greatly appreciated! Majority rules right?! But seriously, they're both SO fun and so cute! My hubby also got me Adobe Photoshop and I seriously have NO clue where to begin! I took a class in high school but I think I have forgotten almost everything I learned! I like the black and white one!!! I learned photoshop via Pinterest!! I actually have a board just for photoshop! Best of luck! I really love the black chevron one but I'm kind of biased because of that awesome pink bow lol. Congrats on your new camera, I love my Canon! This comment would be way too long to explain the ropes of using a DSLR and Photoshop. Not sure if you have Elements or one of the CS photoshops but they're pretty similar. I've pinned so much from pinterest on both learning your DSLR and photo editing. Here is a link to photo tips and here is a link to editing tips. Joining forums is also a good way of learning too. I'm on a forum called Clickin' Moms and it's amazing but there are definitely more options such as Bloom. How fun!!! I'm not that awesome at photography, but I've been wanting to take a class. I love the black and white strap--so fun!! Definitely the black & white with the pink bow! So darn cute! I used photoshop on my roommates computer for our Christmas cards...oh my! I'm so glad she was there to help me out because there is SO much you can do with it! I bet you can find online help. My roommate says she basically just googles how to do everything with photoshop haha. I say the black and white with the pink bow! So cute! I can't even use my phone to take a decent picture so I better not hand out any advice. haha! Love both! I am totally with you! I've had my rebel about 6 months and I looooove it! I have so much fun with it! I am still learning as well though so you are not alone! You are going to have SO much fun with the camera and photoshop, I can not wait to see your pictures. I love your blog and I am now following you - Happy New Year! I say get both straps and switch them around from time to time! :P They both look awesome. I still LOVE the one with the bow!! The one with the bow is amazing! Jenni @ story of my life recommends awesome tutorials for both, try talking to her! I still say pink bow!! you're a lucky wifey!! i love the one with the bow -too cute! I would say the multi-colored one on the right just because even though I love the bow, I think it would drive me crazy after a little while haha, but that's just me. :) Also I loooove the one on the right anyway. Will be looking forward to your pics! I got a new camera last year and although I should use it more I do love it. The best thing is all the memories you capture and look back on. LOVE LOVE LOVE the black and white strap with the bow - so dang precious!! I love the one on the right so much!! Ugh! I need to learn to use our fancy camera! It's old(er), but it takes gorgeous photos IF you know how to use it. Haha. Feel free to visit my web site :: "evening star"
I'm a writer from Eindhoven, Netherlands just forwarded this onto a coworker who was conducting a little research on this. And she in fact bought me lunch just because I stumbled upon it for her... lol. So allow me to reword this.... Thanks for the food... But yeah, thanks for taking some time to write about this issue here on your site.